Fine Kettle spout is easy to control the amount of hot water and speed characteristics. Point items to make delicious coffee. Stemlesdripper to enjoying drip carafe set! Appeared in an authentic copper Dripper V60 coffee Dripper. 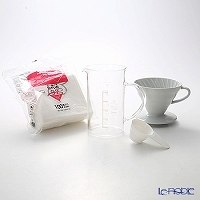 Stylish drip set popular V60 Dripper and beakers. Dripper sets adopted tough ceramic "porcelain". Important preparation for brewing coffee from beans to grind. Born in drip brewed coffee to taste and personal coffee product series. 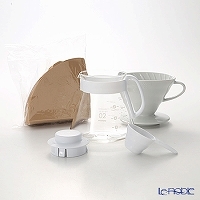 Makes mild coffee, Strength can be adjusted by brewing method. Nordic's stylish coffee maker you can relax! Fluffy painting a picture on the milk and enjoy a cafe table.